The epochs of classic creature features and splatter fests have gradually given way to a contemporary horror film genre shaped by Asian influences and, more notably, the trappings of today’s technology. Starting with Hideo Nakata’s Ringu—a convenient, affecting marriage of these two influences—popular modern scare fare is the stuff of The Blair Witch Project and such progeny as Paranormal Activity. They’re the same chills and thrills, just filtered through the grainy prism of camcorder and surveillance monitors. From this standpoint, The Woman in Black feels more like a musty curio than a standalone frightener. This adaptation of Susan Hill’s 1983 novel—already the basis for a West End theatre production now approaching a run of 23 years—pays homage to the Gothic Hammer Horror films, not coincidental as it is the first feature shot in England under the until-recently dormant production banner in over thirty years. Director James Watkins imbues every scene with the typical tropes: creepy kids, evil apparitions, a vine-covered manse, overgrown cemeteries and an array of spooky toys and music boxes. Shadows flutter about and objects jump out of nowhere, usually accompanied by a musical flourish. It’s all a handsome showcase that taps your sense of nostalgia more intensely than your adrenal gland. Set in Victorian England, Arthur Kipps (Daniel Radcliffe) is a widower whose wife died four years ago while giving birth to their son (Misha Handley). Now a struggling solicitor and single dad, Kipps is dispatched to the town of Crythin Gifford along England’s east coast to attend to the affairs of Mrs. Alice Drablow, a recently deceased recluse. There, Kipps finds a village of the damned as townsfolk grapple with an inexplicable epidemic of their children doing fatal harm to themselves. Ignoring the warning of locals (natch), Kipps snakes his way down a meandering causeway to Drablow’s decrepit estate, an archetypal haunted house cut off from the mainland by the nocturnal high tide. Filmed on the 380-acre Osea Island in Essex, the evocative locale is, unfortunately, far more dynamic than its on-screen inhabitants. After arriving, Kipps’ professional duties quickly take a backseat to wading into the mysterious death of a young boy years earlier. “Don’t go chasing shadows, Arthur,” warns Sam Dailey (Ciarán Hinds), a cynical local landowner. Of course, movies of this sort subsist off such folly, so Kipps not only chooses to stay overnight at the haunted mansion (cueing audience groans and guffaws), but he follows every sounds and opens every locked door, most notably the ghostly presence of the titular femme. There’s surprisingly little blood; the lone sight of crimson, gushing from the mouth of a doomed girl, stands out against a palette that’s as hoary as the horror precepts at play. Radcliffe does well playing Scary Potter but is given little else to do—fans will have to make do seeing him again do battle with a pale-faced villain, visiting an ethereal rail station in the process. Hinds headlines a game supporting cast that includes Janet McTeer (Oscar-nominated for Albert Nobbs and Tumbleweeds) as Dailey’s grief-crazed wife. Their presence marks the only instances the film achieves anything approaching character complexity. That said, Watkins crafts some striking visuals, and audiences pining for the visceral stimuli of an old-fashioned ghost story will occasionally jump out of their seats, at least until fifth or sixth time an empty rocking chair totters on its own or the WIB’s ashen visage appears in a window pane or down a long corridor. 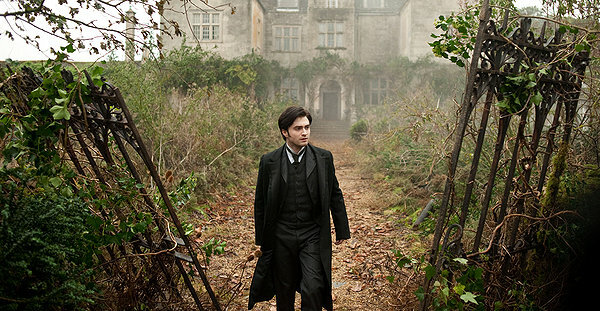 Capped by a cloying climax, The Woman in Black quickly runs out of frights…and clichés. Nice review, though I think I would graded it a bit higher than C+. The film did manage to create a spooky atmosphere, though I think there were only two really good scares; the rest of the time the scares were fairly predictable. Maybe I'm just too jaded!